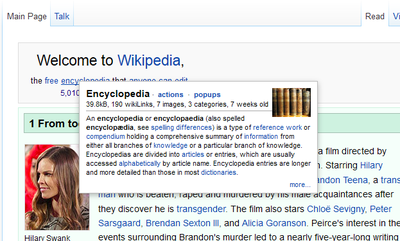 Wikipedia just took a step toward making your visits more economical. The information-providing website has started offering pop-up preview windows to help save you valuable research time. The pop-up windows present users with an image from each entry (if available), accompanied by several sentences that give a sense of what they’re about. The site was well aware of how frustrated visitors were with trudging through countless articles in search of relevant information. Users would be stymied in their search by not knowing what the entry was about until they read it entirely through. Some of those would be incredibly long. The same issues occurred when clicking on hyperlinked keywords and suggestions. That’s why Wikipedia decided to include the hover-over pop-ups—which assist people in their decision to click through or ignore. The change, which applies only to Wikipedia’s desktop version, is one of the biggest to happen to the site in years. As with hover-overs found on other websites, the pop-up will disappear when you move your mouse away from the entry. The new feature can be disabled, but the company says that—based on their extensive testing—most people won’t do that. Another finding is that page views are down. However, that’s only because people are getting exactly what they want in less clicks. This makes the user-experience much more desirable and will keep visitors coming back to Wikipedia for their informational needs. For more articles on what’s trending in the digital world, check back here at Digital Addicts regularly. We cover everything from the latest big movie trailers to what’s happening in the world of video games, as well as what’s new in cell phone spy ware and other cool tech like V.R. glasses, smart speakers, and much more. Don’t see an article on something you’re interested in? Or you want to hear more about something we covered? Let us know in the comments section.